If you look closely, you can read a message in the corals. We are not being metaphorical. Barry and Aimee Brown set out to search for hidden letters among brain coral colonies two years ago near the Caribbean island of Curaçao where they live. They kept track of which letters they still needed to photograph by writing the alphabet in permanent marker on their fins; once they photographed a letter, they marked if off. According to Barry, the letters ‘A’ and ‘I’ were the most difficult to find, while they continued to see ‘S’ wherever they looked. In the reefs of Curaçao, coral bleaching events and strong storms have killed much of the shallow-growing brain coral in recent years. So they had to dive deep to get the whole alphabet, sometimes taking pictures in 100 feet of water. The resulting images show the corals' beauty, and their hunt for the letters highlights some of the threats that face coral reefs. 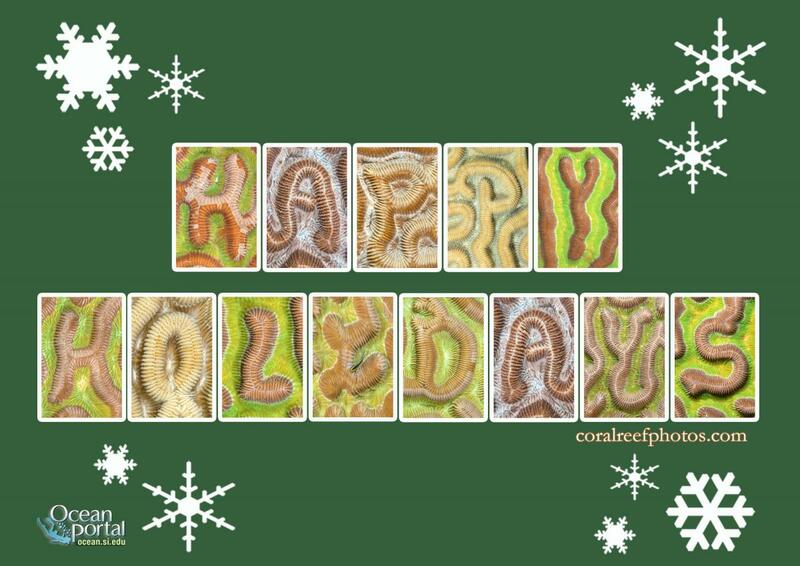 Send a message from the corals to your friends and family with our postcards or e-cards! Click on a thumbnail for a full-size version that you can download, email and/or print. If you're feeling creative, you can also download the full set of letters to write your own coral messages! (Images are compressed in a .zip file.) Please credit the photographers Barry and Aimee Brown, and no commercial use.